The Wiki Education Foundation launched new onboarding and online orientations for instructors through the Wiki Ed Dashboard. We simultaneously launched a suite of modular trainings for student editors. The new trainings focus core learnings in two introductory modules, then provide specific trainings for students based on what students are asked to do in the course, and when. This allows for deeper, more focused, and more timely training experiences for students. Wiki Ed staff visited the University of California Berkeley campus for a faculty meeting with more than 30 instructors. Educational Partnerships Manager Jami Mathewson and Outreach Manager Samantha Erickson also presented Wikipedia assignments to the annual meeting of the Society for Marine Mammalogy. That presentation ended with an expert review of select Wikipedia articles on marine life, which was documented and shared with Wikipedians. Google awarded the Wiki Education Foundation a major sponsorship in support of the Year of Science. Thanks in part to Google’s leadership role, the Year of Science aims to improve science content on 5,000 Wikipedia articles, enhance visual representation of science topics on Wikipedia, develop science communication skills among thousands of students, and improve the coverage of the lives and works of women scientists. 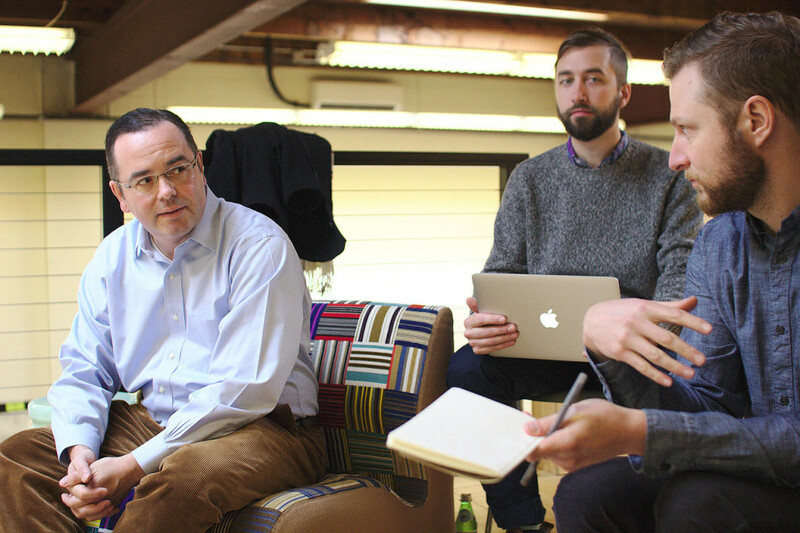 In mid-December, the Programs team participated in a half-day retreat. They engaged in team-building and discussed the evolution of the Classroom Program and Visiting Scholars as well as lessons learned. The purpose of the retreat was to continue the onboarding of Director of Programs Tanya I. Garcia, establish rapport among team members, and set the stage for work in 2016 and beyond. Samantha discusses Wikipedia with a participant at the Society for Marine Mammalogy workshop. In early December, Jami Mathewson and Samantha visited faculty at the University of California, Berkeley, for a presentation about teaching with Wikipedia. They met with more than 30 instructors in departments ranging from American cultures, to plant biology, to Spanish. Instructors had many questions about Wikipedia assignments and the impact students can have on public scholarship. A dozen participants spent an hour reviewing Wikipedia articles in their areas of expertise. They documented their analysis to help others improve the quality of those articles. The outreach team spent most of the month preparing for the spring 2016 term and the kick-off of the Year of Science. The team is proud to have on-boarded 39 spring courses in December, compared to 10 courses at the end of December 2014. Since then, we’ve identified peak periods for reaching out to instructors, and expanded staff time and attention to ensure those instructors have the support the need to participate. We’re excited to bring students to Wikipedia to contribute to the public scholarship of these important topics. Students edited 4,670 articles and created 449 new entries. The fall 2015 term saw some big changes to the Classroom Program. At the beginning of the term we launched dashboard.wikiedu.org, and shortly thereafter, ask.wikiedu.org, which contributed greatly to our ability to support what has become our largest number of classes and students to date. From spring 2015, we saw a roughly 40% increase in the number of courses in our program, and a 60% jump in the number of students enrolled in these courses. The dashboard allowed instructors and Wiki Ed staff to more easily follow student work, ensuring that quality and quantity went hand-in-hand. Ruth Kittner’s class at Carnegie Mellon University was embroiled in the politics and personalities of the French Revolution, working on 17 articles in the topic area. They expanded articles on politicians, plots, and broader social history all during the month of December. Their largest expansion took Wikipedia’s article on the Declaration of the Rights of Woman and the Female Citizen, Olympe de Gouges’ feminist tract that spurred Mary Wollstonecraft to write A Vindication of the Rights of Woman and led to her arrest for treason. Westchester University’s History on the Web, taught by Janneken Smucker, asked students to focus on Philadelphia history. User:Smithje2012 expanded the article on the Philadelphia Tribune, the oldest continually published African American newspaper in the United States. Before this term, the article had been a largely unsourced stub for almost a decade. Now the article is cited to multiple journal articles and offers a history of the paper. Karyl Ketchum’s students at California State University, Fullerton explored a variety of topics in their course on Gender and Technoculture. 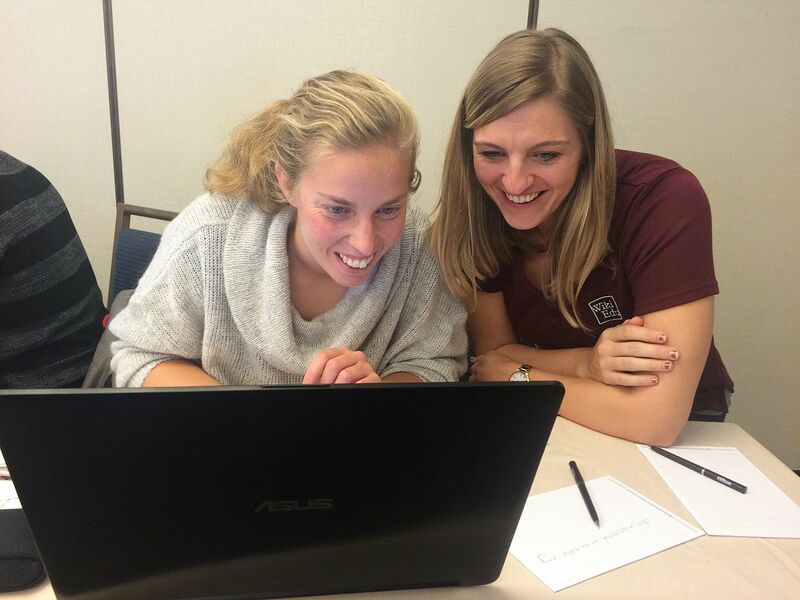 Students have been working throughout the term to expand articles such as women in government, women and video games. All told, the class worked on 45 different articles. 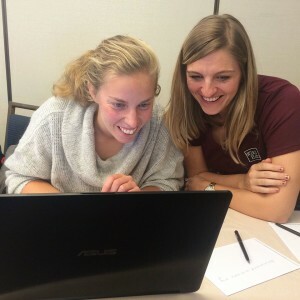 Many of the students added to existing articles, but some created new articles, such as a biography of Rose Lavelle, a member of the US Women’s National Soccer Team, and an article on the protest movement Blue Lives Matter. Insects that go through all four developmental stages (egg, larva, pupa, and adult) exhibit holometabolism (also called ‘complete metamorphosis’). A student in the University of Chicago’s Evolution and Development class doubled the size of the holometabolism article, adding two paragraphs on the evolutionary context and and another five discussing theories on the evolution of this developmental sequence. Students in North Dakota State University’s Mineralogy class created 16 new articles about minerals. These include George-ericksenite, a 3000-word article about a yellow mineral named after USGS geologist George E. Ericksen. Several of the articles created by the students were about minerals named for famous geologists including Bobdownsite, named after University of Arizona professor Robert Terrace Downs; and Waterhouseite, named for Australian geologist Frederick George Waterhouse. The class created two articles, Allendeite and Hexamolybdenum, minerals which were first discovered in the Allende meteorite that struck the earth in 1969. Students in the University of Pennsylvania’s Medical Missionaries to Community Partners class created 17 new articles about medical missionaries. That included a 3,300-word article about Helene Bresslau Schweitzer, a “medical missionary, nurse, social worker, linguist, public medicine enthusiast, editor, feminist, [and] sociologist”. Schweitzer partnered with her husband Albert Schweitzer‘s pioneering medical work in Gabon, including establishing the Albert Schweitzer Hospital. Visiting Scholar Barbara Page created this chart for use in a new article she wrote on chest pain in children. Community Engagement Manager Ryan McGrady focused on preparation for the Wikipedia Year of Science, including developing collaborations with WikiProject Women in Red, WikiProject Women Scientists, the WikiCup, and others in the Wikipedia and academic communities. Two articles by George Mason University Visiting Scholar Gary Greenbaum, Template:Wuser, were promoted to Featured Articles, the highest quality designation on Wikipedia. These articles were Wendell Willkie, about the Republican candidate in the 1940 presidential election who lost to FDR, and GMU’s namesake George Mason, father of the American Bill of Rights. Boroughitis, another of Gary’s articles (see our blog post from November), appeared on Wikipedia’s main page on December 2 as “Today’s featured article,” bringing increased visibility and recognition for the quality of that article. Barbara Page, a Visiting Scholar also at the University of Pittsburgh, created a chart (top of section) for use in a new article she wrote on chest pain in children. Communications Manager Eryk Salvaggio has spent most of December creating and refining content for the new online training tools. 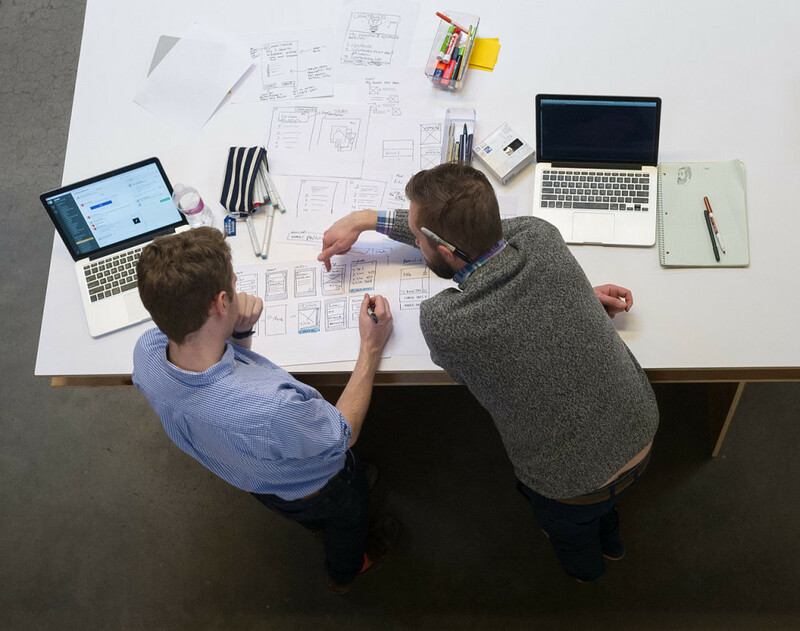 This feedback came from user testing with first-time instructors, alongside Product Manager for Digital Services Sage Ross. Adjustments were ongoing through December, but the training is now live and ready for new instructors and new students. Feminist Theory and Wiki Edu, Hobart and Willam Smith Colleges (University News) (December 30). WINTR staff map out forthcoming Wiki Ed technical projects. a major update of the editing interface for course timelines, which makes both creating assignment plans and rearranging existing timelines much easier. Along with a number of smaller interface refinements and bug fixes, those three updates address the most significant user experience pain points we identified in fall 2015. We’re looking forward to in-depth user tests for the new student training modules, which we will continue to refine into January. Alongside the Dashboard system, we started planning something new in December: a social media tool for the Year of Science to help people share the joy they find in Wikipedia. Executive Director Frank Schulenburg and Director of Program Support LiAnna Davis joined Sage in Seattle for a planning sprint in the offices of our development partner WINTR. This project — we’re calling it the ‘Wikipedia playlist’ — will launch in February. In December, we received funding from the Simons Foundation ($350k), Google ($500k), and individual contributors ($44k). 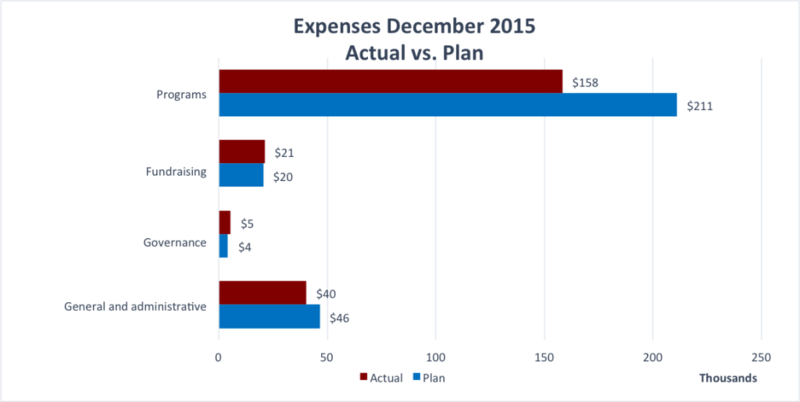 Expenses were $225,184 versus the plan of $282,321. The main cause for the $57k variance was an earlier decision to hold off on expanding office space and staffing until we had a better handle on long-term funding. Timing of certain expenses (Staff Development, $21k; Travel and Conferences, $18k). Our current spending level has averaged and maintained at 80% of planned over the last 3 months. 100% of the Foundation’s Board of Directors participated in the 2015 year-end giving campaign. The development team has begun planning for 2016 cultivation events in the Bay Area and Houston, Texas. Frank discusses his vision for the Playlist with WINTR staff. Frank has followed up with the New York Academy of Sciences on a possible collaboration during the second half of the upcoming Year of Science 2016. The New York Academy of Sciences will provide Wiki Ed with a first budget estimate, so that it can be decided whether that collaboration will be included in next fiscal year’s plan. Executive Assistant to the ED, Renée LeVesque, organized a holiday staff lunch at the restaurant “Il Fornaio” for people in San Francisco. She is also getting ready for an emergency preparedness training for San Francisco staff to be held in January. 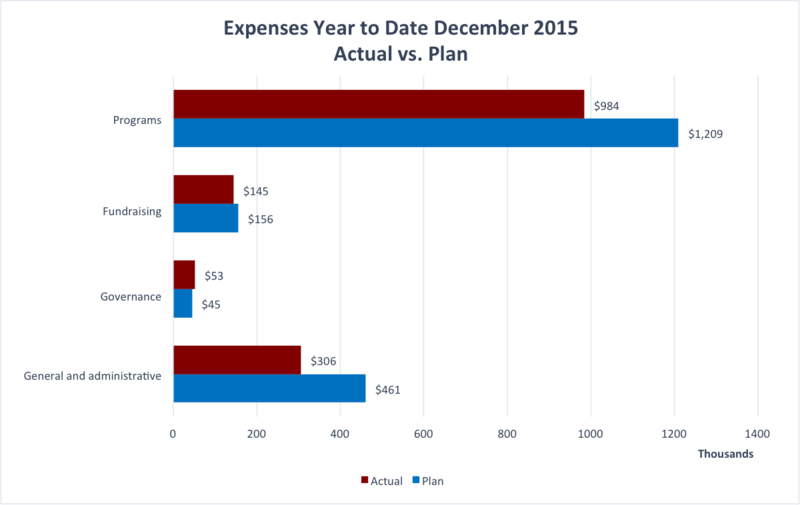 Frank developed the process for the annual planning and budgeting cycle that will start in January 2016. He introduced the Senior Leadership team to the process and ensured that the group has a shared understanding of roles, responsibilities, and expectations.